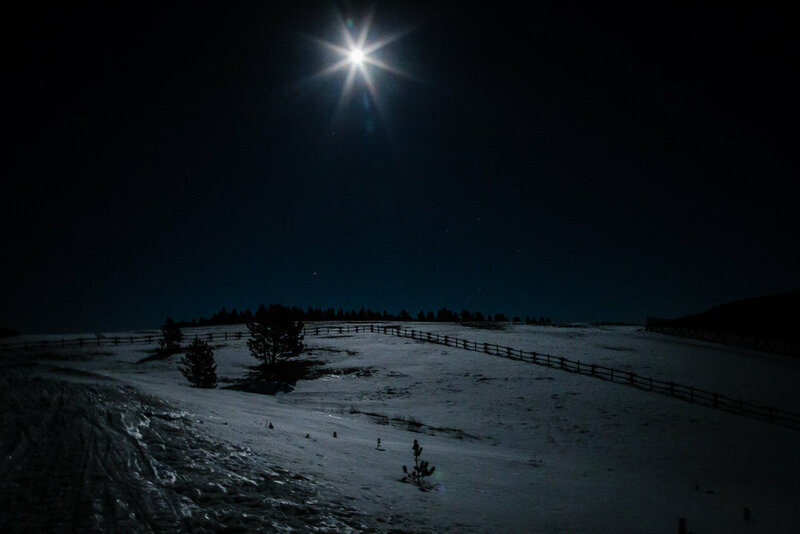 The shadows of pines notched the edge of the meadow; the expanse of snow, like a bowl in its middle, was creamy-white in the moonlight. All was quiet and still, save for the gliding of my skis and the chunking of my poles in the rigid snow. Nellie bounded ahead, as she always does, her form going grey, then golden in the slow blip of moonlight as she passed from shadow to shadow and out of sight. I was alone, then, skiing in the moonlight, wondering how far she’d gone. Never too far. Sometimes I’d call for her; most times I didn’t have to. There she’d be, coming, wild-dashing back to me, like she’d lost me and found me again. Smiling, though, always smiling, tongue lolling, panting happy. Above us, the supermoon hung, glowing quietly, gently, as any nightlight should. I was enraptured by this - the navy sky flecked with stars, the milky orb of light, the snow beneath me, the solitude around me, the sweet knowing that I’d finally, finally done it. For years, I’d dreamed of doing a full moon ski at night in the mountains. Each year, however, realizing how difficult such a thing was to come by. For the moon is full only a handful of times in a winter, with no guarantee of clear skies on any one of those nights. And, of course, to ski, there has to be snow. Then, mix in life’s schedule and people and other important things (especially a particular one called sleep), and it’s easy to see how the dream could take so long to arrive. But there I was, the only person in that meadow, on that mountain, on this night, in this moonlight, and I was gliding through my dream. Quite literally gliding through my dream. In all my years of anticipation, I’d not even thought to wish for a supermoon, or for my full moon to fall on the vernal equinox, but there they were, the largest of moons, on the first day of spring, gifts greater than I’d even known to hope for, a perfectly orchestrated coincidence of miracles.